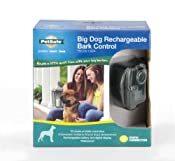 The new Rechargeable Bark Control collar stops nuisance barking. The patented Perfect Bark ensures your dog's bark is the only sound that will cause a correction. This user-friendly bark control collar automatically customizes its correction to give dogs the most fair and effective training possible. Matched with all-weather durability, this collar provides perfect combination of toughness and intelligence. The collar has three modes of correction: temperament learning, progressive correction and manual/user-selected mode.